Each registered attendee will receive a "Certificate of Attendance"
"Very informative and interesting presentation. Lively, well-informed presenter. Held my interest from beginning to end of presentation. Kudos! Excellent use of examples in terms a layperson can understand." How many times have you left a medical interpreting assignment wondering what you did wrong? Or if you missed something critical in facilitating communication between a patient and provider? Should you have done more? Less? Frustration, self-doubt, and second-guessing can be particularly troubling for experienced, trained interpreters who know their field very well but have never practiced medicine. 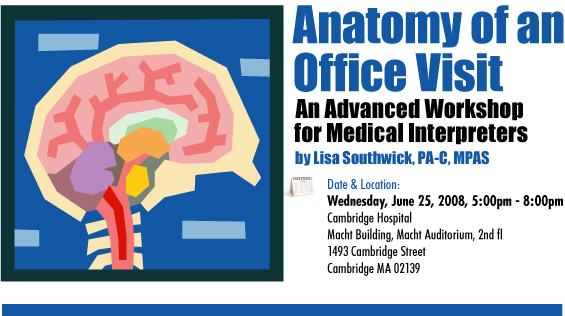 In this workshop, Lisa Southwick, a practicing physician assistant and former sign language interpreter, will “dissect” an office visit to provide insight that will enhance interpreters’ confidence and clarity during medical encounters. 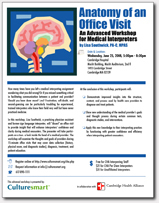 The presenter will take participants on a tour: a look inside the head of a medical provider. The workshop will examine the thoughts and goals of providers during 15-minute office visits that may cover data collection (history, physical exam, and diagnostic studies), diagnosis, treatment, and patient education. Demonstrate improved insights into the structure, content, and process used by health care providers to diagnose and treat patients. Show new understanding of the medical provider’s goals and thought process during certain common tests, diagnostic studies, and interventions. Apply this new knowledge to their interpreting practices by functioning with greater confidence and efficiency when interpreting patient encounters. Lisa Southwick, PA-C, MPAS, is a nationally certified physician assistant, educator, and former sign language interpreter for the deaf. Her experience and interest in curriculum development, novel teaching approaches, cultural competency training, and medical interpreting combine to create a unique perspective, that of a health care provider with an intense appreciation of and sensitivity to the critical nature of medical interpreting. Lisa has presented regionally and nationally on the topics of medical interpreting, disability, and cultural competency in medicine. She authored and implemented a 100-hour medical interpreting curriculum for spoken and sign language interpreters in Portland, Maine.